Welcome to our countdown, dear readers! At least, we’re going through our top picks from SM – Celestial Storm. Some of you may be wondering why this didn’t happen sooner, and that is all on me. I was tempted to have us wait until post-rotation, and I think we’re all going to SCORE for the SM-On Standard Format instead of for the not-quite-three-weeks left of the current BKT-On Standard Format. If you’re new to our countdowns, the individual reviewers submit their own personal lists (usually Top 10’s), and someone (often me) tallies it all to create a “master list” for our CotD crew to review. Reprints are only allowed if they are deemed “significant”, which usually means a card returning to Standard or both Standard and Expanded Format play (and of course, being good enough to have made the list if it would have been new). We begin this week with our 10th place pick, Acro Bike (XY Primal Clash 122/160; SM – Celestial Storm 123/168, 178/168), which is indeed a reprint that returned Acro Bike to Standard Format legality. Acro Bike is a Trainer-Item that allows you to look at the top two cards of your deck, select one to add to hand, and then discard the other one. Technically, this is a “search” effect, but with such a small range it functions like draw power. As a general use card, this gives you some generic deck thinning with a low cost, low reward, and a variable risk. Some cards are quite easy to recycle, but others are much trickier; you have to worry about cards that you cannot afford (or flat out cannot) recycle, at least within a given deck. There are also some cards you’ll want in your discard pile. The exact balance of these in a deck can make Acro Bike a foolish, sensible, or brilliant inclusion for a given deck. With the Standard Format shifting to SM-On, which lacks both N and Professor Sycamore, we find ourselves needing more draw AND discard power in our decks. What’s more, I’m a proponent of Magcargo (SM – Celestial Storm 24/168) and the combo is just magical; you can guarantee either the draw or discard of your choice! That may not seem like much, but this is an incidental combo from running two cards that I think are good separately. There are some concerns for Acro Bike, and we learn them from the cards history. Let’s start with our original review of Acro Bike. Even though it was our 8th place pick for XY – Primal Clash, none of us that wrote about it too enthusiastically. 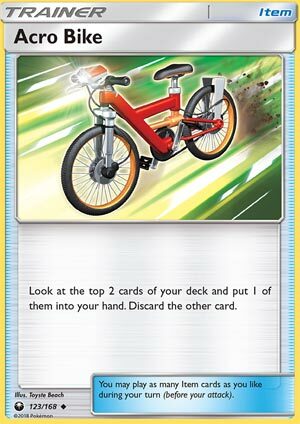 A major aspect of this was Trainers’ Mail overshadowing Acro Bike; while you risked whiffing with it AND it could only snag Trainer cards (excluding another copy of itself), Trainers’ Mail required no discard. This was also months before the ban of Lysandre’s Trump Card, which means it was before Night March suddenly became a great deck (and gave us an example of a deck that often benefited from the discard cost). So, times changed, and Acro Bike became a great play in specific decks and a good play in most decks. Then, the times changed again; multiple anti-Item effects finally made Acro Bike a little too risky. One worth mentioning by name is Garbodor (SM – Guardians Rising 51/145, 51a/145); its “Trashalanche” attack does more damage based on how many Item cards are in the opponent’s discard pile. Not only would Acro Bike add to this damage, but sometimes so did your choice of discard. Acro Bike appeared on only two of our four individual Top 10 lists, but it still earned 47 voting points. This actually means it tied with what would have been our 11th place card; the final order was determined by roll-off. It was my second place pick, but I’ll add the grain of salt myself by pointing out that this was based purely on its past performance plus Theorymon as I haven’t been able to test for SM-On, and the BKT-On decks I tried after SM – Celestial Storm was made available contained Zoroark-GX (I didn’t think I also needed Acro Bike). If I am right about Magcargo, Acro Bike’s value goes up a little in Expanded, which is good for it because I’m not finding it among the decklists I have for our last major Expanded event (admittedly, from over 2 months ago). Its value in Limited is high, but remember that you probably have no way of getting something you discarded back if you hit two cards you need. Welcome to another countdown of the 10 best cards of Sun and Moon Celestial Storm! This set is brimming with mostly modernized cards from the Neo-era and the ex-era expansions. This gives me another feel of what the cards were like back in 2000, which is good for me because I started collecting and playing at Diamond & Pearl series. But before we explore as much cards as we can, we have to first look at cards that have competitive value. And taking on the 10th place spot is Acro Bike. The review crew actually reviewed it when it was the 8th best card of XY Primal Clash (https://www.pojo.com/COTD/2015/Feb/11.shtml). Reading past reviews means that they weren’t overly excited about this card, but times have changed. Despite not putting Acro Bike in my personal Top X list due to being a reprinted card, I will still praise this card. This item card lets you look at the top 2 cards from your deck. You pick one of them to go in your hand and the other card goes to the discard pile. Acro Bike enables ideal technical plays. Most stuff that are in the discard pile can be retrieved. For Pokémon, you’ve got Rescue Stretcher; for Basic Energy, you got Energy Retrieval or Energy Recycler; for Supporters, you’ve got Pal Pad or Vs Seeker to get those back. The two category, however, that are hard or impossible to retrieve is item and Stadium cards, so proper care should be taken if you’re stuck with those categories. Does it see play everywhere? Probably not, those it might be used in decks that wants to mow down their deck to get the cards they need fast. So speed and aggressive decks will love this card. Actually, any decks will love this card if they got room to fit it in their decks. In Limited, regardless of expansion, this is a good pull and a must run. Acro Bike (CES 123) returns to the Standard format after a year’s hiatus from the rotation that occurred almost a year ago. When last we saw this card, it facilitated the success of decks like Vespiquen (AOR 10) and Night March (Joltik PHF 26), accelerating their development and adding fuel to their fire. Coming out of Guardians Rising WAY back in May of 2017, I originally thought that Field Blower would stand as the most impactful card coming out of the set. I changed my mind, however, and settled on Trashalanche Garbodor (I do just fine without Lele… actually, many of the decks I’m playing don’t have room for Lele on the bench). Garbodor has not seen a lot of use since September of 2017 primarily because we’ve lost so many prevalent Item cards: VS Seeker, Trainer’s Mail, and TAH DAH! Acro Bike. Now that we’re starting to get back some Item cards that facilitate strategic development (Order Pad, Acro Bike) and offensive acceleration, GRI Garbodor may slowly sneak back into the meta. I watched a video the other day where a Youtuber got completely dominated by GRI Garb while playing Rayquaza, and I’ve lost to it as well while playing Rayquaza. The more Items we start playing, the more we’ll start to see a resurgence of GRI Garb, and that’s bad news if you’re playing Acro Bike. I had Acro Bike as my third best card coming out of the Celestial Storm. Shortly before it rotated previously, it had fallen out of use primarily because of 1) GRI Garb and 2) Trainer’s Mail functioned equivalently and didn’t force you to discard a card. But in our Item acceleration deprived format, I would definitely recommend it as a four of in many decks right now. Welcome to the Top 10 Celestial Storm Countdown! As always, we compiled a few lists of what we each picked out to be the best cards in the set – and this set was very interesting, to say the least. Not only were there new cards to be had, but a lot of cards are reminiscent of older cards! And today’s card…is just a reprint. BOO! Acro Bike is an Item card that lets you look at the top two cards of your deck, and then you put one into your hand and the other in the discard pile. This card was actually printed back in Primal Clash, so if you’ve been hanging out in Expanded for the last year or so, you’ve likely seen this card floating around. And as far as Trainer-based draw that doesn’t have the Supporter clause going for it, Acro Bike is practically the best. Think of it this way: Acro Bike is a draw 2 that lets you put one of the cards you drew into the discard pile. That could be an Energy to accelerate out, a Supporter to combine with VS Seeker, a Pokemon to power up…well, one of those Pokemon that gets stronger with more Pokemon in the discard pile – the utility is actually really big! And considering our best Supporter right now is Cynthia, we could use a little extra boost in the draw department. So while it is a reprint of an older card, a lot of us felt that its usage justified a clear mark-up on the Top 10 spot. Me, I don’t really focus on the reprints myself, but I can’t exactly ignore Acro Bike either. I mean, have you seen the crazy tricks you can do on one of these? It’s crazy. Arora Notealus: Acro Bike is technically one of two different bikes you’re able to get, the other being the Mach Bike. As the name would imply, the Mach Bike was built with speed in mind, while the Acro Bike was more for…”acrobatic” maneuvers, hence “acro” bike. Pretty neat stuff, admittedly – not too many games get the option to implement wheelies and bunny hops not only into the game itself but even some of the puzzles as well. Next Time: A fresh take on an older card, and possibly one of the most dangerous!